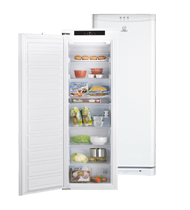 Designed to fit seamlessly into your kitchen, shop at Soundstore for the ideal integrated Freezer for your home with top brands such as Belling, Miele, Hotpoint, Indesit & more. Fast & Reliable Delivery Nationwide. NoFrost: No more manual thawing. LED Lighting: Pleasantly bright light. Don't miss out on any of our huge savings!